European Spallation Source ERIC (ESS) hosted 15 Industrial Liaison Offices (ILOs) from its Partner Countries across Europe for the eight time. The meeting prvoided the participating ILOs with the opportunity to get the latest update on topics related to the ESS project, including ESS subprojects statuses, and as well general information about procurement and in-kind contributions. They also received informed about the two upcoming events, taking place in Copenhagen - International Particle Accelerator Conference (IPAC'17) organized in May 2017, and Big Science Business Forum, planned for February 2018. ESS Director General John Womersley opened the meeting and presented the project status update and the progress of the construction work. The meeting continued with an update on the procurement at ESS by Meredith Shirey, Head of Procurement and Gábor Németh, Head of In-Kind. Their presentations were followed by in depth overviews of each subprojects by Head of Accelerator Division, Mats Lindroos, Deputy Head of Target Division, Rikard Linander, Head of Integrated Control Systems, Henrik Carling, and Neutron Scattering Systems Project Leader, Shane Kennedy. The ILOs were also encouraged to take the opportunity to engage their industry contacts in the preparations of and participation at the two upcoming events - 8th International Particle Accelerator Conference, presented by ESS Exhibition Manager Roger Eriksson and Big Business Science Forum, presented by Toon Verhoeven, ILO representing Netherlands. At the end of the day, ILOs held and internal meeting, including re-election of the Chair of the ESS ILO Network, where Arne Jensen from Denmark was selected for the second time. 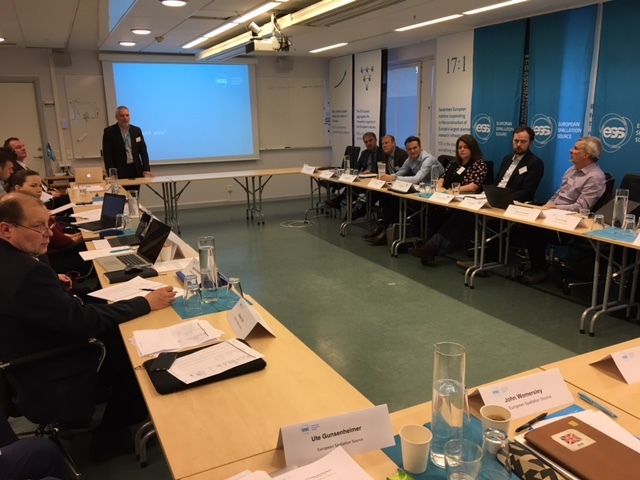 The re-elected chair Arne Jensen, then conveyed to the ESS representatives the recommendations from the ILOs on the improvements of the ILO Network usage and shared their suggestions in the area of internal procurement and in-kind procurements. The main significance of the biannual meetings is to provide the ILOs with information to initiate further discussions with industry and partners in their respective countries on collaboration oportunities at ESS. The 9th ILO meeting is expected to take place in September 2017 in Lund.